The largest ski domain in the French Pyrenees, the Grand Tourmalet has carved the lion’s share of Pyrenean ski resort tourism. With wide ski runs and an infinitely varied off-piste domain, the sparkling Pic du Midi rises majestically above the jagged peaks of the surrounding mountains eroded by the winter winds. That’s the backdrop. And between Barège and la Mongie, there are 71 pistes and 36 lifts, offering visitors the best skiing experience in the whole of the Pyrenees. In short, a great resort that’s made to measure for skiing! The Pic du Midi: it’s sure that with such a huge emblem sitting aloft like a gigantic trophy, the Grand Tourmalet was bound to attract attention from the very start! For 130 years, the Pic du Midi has been a major tourist attraction. The observatory is open day and night, and from there you can gaze across the horizon of the Pyrenean peaks for more than 300km. To reach this eagle’s nest at 2877m, you take the cable car from La Mongie. Of course once you’re up there, you can ski back down. Even if you no longer have to have a guide since the winter 2006, you do have to sign a discharge. You should keep in mind that the Pic du Midi trail is not simply an extension of the resort but a risky mountain route that only confirmed skiers and mountaineers can reasonably attempt. The relatively steep slope is prone to impressive avalanches from the top! You also need to be really sure-footed if the snow is hard and frozen as these challenging conditions have led many a skier to come a cropper after losing their footing around the top of the slope! The trail itself is not very difficult to follow, on the other hand. You ski just below the observatory to join up with the old military barracks. 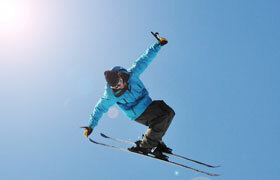 Stay right and relatively high up on the side of the slope. Exit right when you get to the pass, which will take you back onto the resort pistes. Not a very complicated run it’s true, but don’t even think of leaving without a lot of serious preparation beforehand. 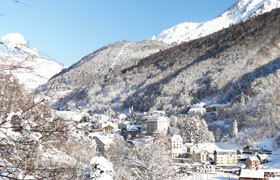 Barèges is the village resort on the west-facing slope of the domain of Tourmalet. It’s not very high (1240m) but the nearby forest gives it a great atmosphere. When the skiing is over for the day, the life in the streets, bars and restaurants goes on just like in any other village. That’s a major selling point for Barèges, which didn’t get its reputation for nothing. As well as being very friendly, Barèges is at the foot of the most mythical stage in the Tour de France bike race: the Col du Tourmalet. Not bad for this small High Pyrenees village, which is also the highest thermal resort in France, and is well-known and popular for the therapeutic value of its… baregine. Baregine is a mix of blue algae and sulfoxidizing bacteria, which gives the thermal water its characteristic smell of rotten eggs. A treasure from the depths of the earth, baregine (a whitish, mucilaginous complex) is used as an ingredient in balms and creams to relieve joint and muscle pain. The therapeutic effects of these strange filaments, still collected in the traditional way, are medically proven. In short, it works, and has made Barèges famous. The name Mongie comes from ‘Monge,’ which refers to the monks who retreated into the mountains in the Middle Ages. At the beginning of the 20th century, La Mongie was still only mountain pastures and shepherds’ huts. Nestling at the foot of the Pic du Midi on the eastern slope of the Grand Tourmalet domain, La Mongie is a traditional ‘ski-in-ski-out’ resort, which, while very practical, is rather impersonal, and some might even say ugly. On the other hand, the surrounding alpine atmosphere offsets the resort’s somewhat unedifying architecture! Skiing first began here in 1921, although not very seriously, and it wasn’t until 1945 that a real Pomagalski drag lift was installed (with the famous releasable cable grippers patent). 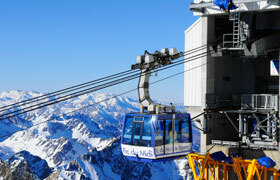 The resort’s other major asset was the opening of the Pic du Midi cable car that took visitors up to the 19th century observatory. The link with Barèges via the Tourmalet pass was built in 1973. There have been many improvements since the 1950s, so that today the Grand Tourmalet is a domain which rivals with the top European resorts in terms of standard of pistes and facilities. 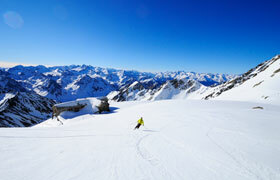 The pistes in La Mongie are wide and pretty busy and you’ll either love them or hate them! On the other hand, you’ll find some wonderful off-piste skiing opportunities less than 10 minutes walk away, including la Brèche at the top of Quatre Thermes… The alpine mountain surroundings and excellent off-piste skiing are La Mongie’s strong points. 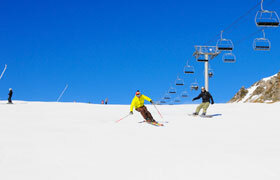 We think that the most interesting official ski pistes are on the Barèges side, especially around Lienz and la Laquette. Here, you’ll find plenty of fir trees, which are really beautiful after a heavy snowfall. What’s more, you don’t get the very long queues for the ski lifts that you find in La Mongie. Often taking a back seat and considered as little more than a sideline in resorts that focus on downhill skiing, snow parks have now become far more popular. Like most of the resorts in the Pyrenees, the Grand Tourmalet is ahead of the game and has created snow parks that are both sustainable and exciting. In Barèges, the Park des Etoiles is located just below the Tourmalet 6-place chairlift, near the blue piste in Tourmalet. There are 20 modules in all, but it’s designed for more expert snow enthusiasts as there is no rail or box for beginners. It includes 5 trails for 3 levels (2 boarder cross and 3 areas with rails and modules). Beginner freestylers are better off going to the Pene Blanque Mini park in La Mongie, which you can get to by taking the TK Pene Blanque. The snow guns provide 172 units so the cover is modest but sufficient given the generally good snow conditions. 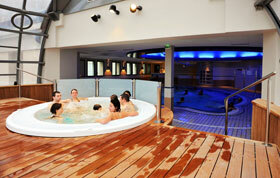 Check the website www.grand-tourmalet.com for special offers. If you’re looking for accommodation, you’ll find a wide choice of holiday rentals on MediaHols at Barèges and La Mongie. 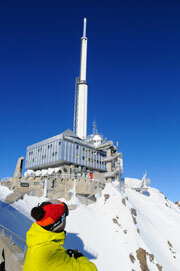 The Pic du Midi observatory is open throughout the year with permanent workshops. You can book a "night of stars", returning to La Mongie at 11.30 pm. New in 2011: the chance to descend on skis during the full moon (more information on www.picdumidi.com). 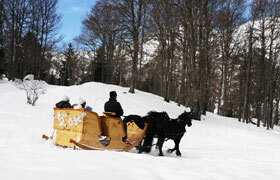 To find out more about Pyrenees resorts, read our articles on Luz Ardiden, Baqueira, Andorre, Cauterets and Gavarnie.